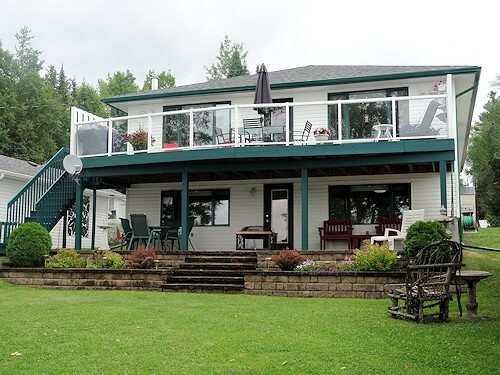 Situated on the shores of One Island Lake, this exceptional and luxurious year-round home was custom built by Sakiyama just 16 years ago, features a finished walk-out basement with heated floor, plus comes with a guest cottage and sauna building! Enjoy the incredible waterfront setting from the large deck, which is accessed by a garden door in the living room, or on the large interlocking-stone patio, accessed by a garden door in the spacious family room. The living room, formal dining room and oak eat-in kitchen are open-concept. The living room has a wood-burning fireplace and large picture window overlooking the lake. The dining room has oak built-in cabinets. The home features three bedrooms as well as three bathrooms. The master bedroom has a four-piece ensuite with double sinks, and two closets. The third bedroom also has two closets. Oak trim and doors are throughout. Other extras of this impressive home include central air conditioning, a water-purification system, security system, central audio system with speakers inside and out, in-ground sprinkler system, as well as an attached double garage with automatic door opener. The guest cottage has an open-concept living room and kitchen, as well as a bedroom.